Any MBA can improve your management skills. Ours will change your life. You’re interested in an MBA because you want to become a better manager, improve your job opportunities, get a raise or a promotion. Those are reasonable goals, ones we can help you achieve. But to be honest, any MBA program can improve your management skills. And we’re not satisfied to be just any MBA program. At Bethel, we’re committed to transformation. We want to address your development as a whole person: professionally, intellectually, personally, ethically, and spiritually. When you graduate with an MBA from Bethel, you’ll be a different kind of person. Whatever your leadership gifts now, you’ll be challenged to take them to the next level. To infuse them with not only confidence and passion, but character, wisdom, and grace. We’ll train you to become the kind of discerning, ethical leader that companies are looking to hire and promote. Let’s get down to business. The Finance concentration is for those who want to take a deeper dive into the finance discipline. You'll study quantitative statistics and global finance trends to make smart business decisions, and you'll make financial decisions for a mock company to see the results in real time. This concentration is for those who wish to be a confident leader in the global marketplace. You'll learn the intricacies of global finance and what it takes to manage global operations. The Healthcare Administration concentration is for those who aspire to become leaders and innovators in the healthcare industry. You'll study healthcare policy, health informatics, and finance trends to make informed and ethical decisions in the healthcare setting. The Management concentration provides additional skills to those who want to excel at making great decisions and getting things done. You'll learn the secrets of successful projects and develop a more acute sense of what keeps operations running smoothly. The Strategy and Execution concentration is for those who want to drive growth and revenue in today's chaotic marketplace. You'll learn how to create an environment of ongoing innovation, craft advanced business strategies, and then execute on those strategies. You will also learn how to bring new products and services to market either as a new business or as part of an existing business. Join us to hear more about Bethel's MBA and Strategic Leadership programs! Today’s society is suffering from a deficit of ethical leadership. At Bethel, we aim to change that. Our courses are open to all students, but our faculty teach from a Christian worldview that is an essential and distinctive part of Bethel’s DNA. We don’t just teach ethics—we live them. Our faith is central to everything we do. We approach education holistically, preparing you personally, ethically, and spiritually as well as professionally and intellectually. You’ll graduate from Bethel with more than an MBA. You’ll strengthen your character, broaden your perspective, deepen your compassion—and in the process become the kind of business leader every company is looking for. Bethel’s MBA faculty are accomplished business practitioners who’ve earned a Ph.D. or are professionally qualified by their credentials as CEOs or other C-level executives. They bring high-level vision and hands-on experience to enhance your learning process. We welcome all students from a diversity of backgrounds, but our faculty teach from a Christian worldview. We emphasize character development that is fueled by genuine transformation. We do everything we can to support your educational goals as you balance graduate school with your job, family, and community commitments. Begin your MBA program whenever you want—we offer new starts every six weeks. Gain maximum focus by taking one course at a time for six weeks. And choose your preferred learning environment—every course in our program is offered online or face-to-face. Job descriptions may change, but businesses will always be looking for ethical leaders. We train you not just for a position, but as a person: professionally, intellectually, personally, ethically, and spiritually. Beyond our expert faculty, your leadership development and career goals are supported by professional certified career coaches who integrate insights from a variety of personalized career assessments. You’ll also have access to more than 22,000 Bethel alumni who are highly regarded, successful professionals willing to share encouragement and experiences. 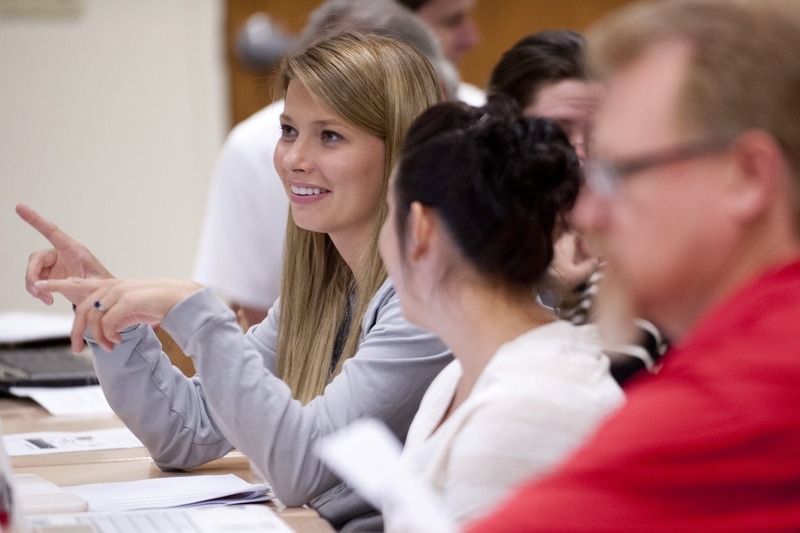 Only Bethel offers a dual-degree option that sets you apart from all other MBA graduates. Our MBA program shares leadership courses with our Master of Arts in Strategic Leadership (MASL) program, so you can complete the MASL by adding only six to seven courses after completion of your MBA. In three years, you’ll hold two master’s degrees and possess the technical and leadership training to excel in any business environment. Many Bethel MBA students find better jobs or are promoted even before graduation! All information accessible to the public regarding the program is available in the Public Information Data (pdf). Bethel’s MBA program will transform you professionally, intellectually, personally, ethically, and spiritually. You’ll become the kind of discerning, ethical leader that companies are looking to hire and promote. Our graduates work at prestigious organizations in a wide variety of career fields.